C Program to find the area of an equilateral triangle – In this particular article, we will detail in on the various methods to calculate the area of an equilateral triangle. In this blog piece, we have added suitable examples and sample programs for your better understanding. The compiler has been added as well so that you can execute the codes. As you all know, an equilateral triangle is a triangle whose all three sides are of equal length. Because of this very fact, all the angles of an equilateral triangle are equal as well, i.e. 60 degrees. 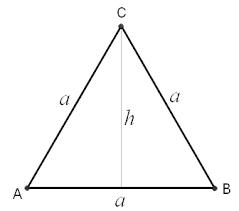 As you can see, this is an equilateral triangle with a side length of “a” units and a height of “h” units. The altitude of an equilateral triangle cuts the opposite side at right angles. So, by using the Pythagoras theorem, we can calculate the height of an equilateral triangle to be sqrt(3/4)a. 1)For calculating the area of an equilateral triangle, we need the only side of the triangle. 2)The value of side will store into the variable “a”, and “a” value will be substituted into the formula, then we get the area value. 1)We are using the function area(float a) to calculate the area of an equilateral triangle, where the return type is a float. 3)area(float a) calculate the area of an equilateral triangle and return the area value, that value will be assigned to the variable “Ar”. 1)We are calling the function as area(&a,&Ar), here we are passing the references/addresses of variables a,Ar. 2)The function area(float *a, float *Ar) will calculate the area of an equilateral triangle, which is having pointers as arguments. 1)Line 3 represents area(a) is symbolic name to the expression (sqrt(3)/4)*a*a. 2)area(a)replaced with that expression given at #define.